Over the last decade, both pharmacists and pharmacy technicians have experienced a widening in their role in the pharmacy. To meet the growing demands of the public, pharmacists are expected to focus more on patient care services, which leaves pharmacy technicians to perform tasks that were once reserved for pharmacists. 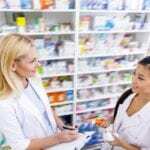 As pharmacy technicians take on an expanded role, it is not surprising that state regulations emphasize the appropriate educational and certification requirements for technicians to step into these new roles. A pharmacy technician’s responsibilities might include counting tablets, calculating dosages, receiving and preparing prescription requests, preparing insurance claims, stocking inventory, answering phones, operating the cash register, and performing other administrative duties. In the new and expanded role, a technician’s duties may include collecting medical histories, communicating with prescribing patients, managing inventory, administering authorized tests or immunizations, and following up with patients. Through the assumption of these duties that do not require the professional education or judgment of the pharmacist, technicians give pharmacists the freedom to provide more clinical services, especially in community settings. Pharmacy technician programs are designed to prepare students to assume the increased responsibilities in a safe, effective, and confident way. Pharmacy technician certification through recognized agencies like the Pharmacy Technician Certification Board confirms to employers that a technician has the baseline knowledge to provide clinical services without compromising patient safety. The pharmacy technician program at Health Tech of Georgia prepares students to fill prescriptions and other distributive tasks under the direction of a licensed pharmacist. The curriculum emphasizes knowledge of drugs and accuracy in dispensing. Course topics include basic pharmacology, correct dosage forms, drug calculations, medical terminology, basic math, anatomy and physiology, and dispensing prescriptions. The program also includes an opportunity for students to put their knowledge to work in a clinical setting where they will work under the supervision of a pharmacist and alongside other pharmacy professionals to dispense prescriptions. The program is designed to be completed in 52 weeks (300 hours) and includes 40 hours of clinical practice. Classes meet Monday and Wednesday from 6:00 pm to 10: 00 pm. Tuition for the program is $1,289. The application fee is $35, and insurance costs $10. A flexible payment plan is available. Students must make a down payment of $249 and agree to the 8 percent interest rate. Central Georgia Technical College facilitates a Pharmacy Technology Diploma to give adults the knowledge and skills for employment in a pharmacy setting. Students will learn how to perform technical duties that will make them a valuable asset to the pharmacy team. In addition to classroom theory, the pharmacy externship and hands-on experiences in a simulated lab will reinforce the theoretical principles. Course topics include fundamentals of English, foundations of mathematics, basic psychology, introduction to healthcare, pharmacy technology fundamentals, pharmacy assistant practicum, pharmacology, medical terminology for allied health, structure and function of the human body, and pharmaceutical calculations. Other topics include an introduction to computer literacy, principles of sterile medication preparation, and advanced pharmacy technology principles. Students must complete a total of 56 credits to graduate from the program. Admission to the program is via a competitive selection process. Although an application who has been convicted of a felony or misdemeanor may be admitted to the program, the conviction may prohibit the student from taking the National Certification Examination. Tuition for the program is $6,174. Books and supplies cost an additional $2,058. Note: CGT also hosts a Pharmacy Technician Certificate program that requires completion of 18 credits to graduate from the program. It is available through High School/Dual Enrollment only. The program costs $2,225 and runs for 18 weeks.